And although I’ve been ignoring my blog, I’ve been using Facebook as a procrastination tool just like everyone else on campus. So I searched “timeline,” clicked on the page, scrolled past the description stuff that I had read months ago, and upgraded. My profile, and just my profile, was upgraded instantly. I noticed that the profile picture shrinks to somewhat of a larger thumbnail while the new “cover photo” gets the attention and space at the top of the page. I decided to add a nice pic of my friends and I from a recent Semi-Formal dance we went to. I started looking through my profile. Seems more visual; photos are larger and there’s less text. I couldn’t help but keep thinking about the Tumblr interface while scrolling on my page. And in true “timeline” fashion, one can easily jump around the times of events and stuff more easily, whether that be days, months, or years ago. More visual. Regardless of how much we want to accept it, people today want things quickly, and even reading can slow down an experience. Facebook is used by many for photo sharing, so a larger photo presence makes sense. The “cover photo” is a great way to even further express a highlight in your life. Easier to go back and find those “lost posts” or memories. On every post, you can click on a little star icon to “feature” that post. Doing this expands this post to the full width of the Timeline. It’s a good way to highlight, for example, photos from a graduation or party. Timeline may include everything from the day you got a FB profile, but it gives you the option to make whatever you don’t want out there private. Information page is cleaner and more organized. The advertisements are squished more-so to the right, and take up less space. I didn’t even realize they were there at first! Forced on all users on December 21. No choice. While the cover photo is great, the profile pic shrinks to a square. Hmmph! Potential won’t be fully met. Not all users posts where they jog or use Facebook to check-in to Places. Even I, as tech savvy as I am, don’t use all of Facebook’s features. Most people use it for photos and status updates. The new “Activity Log” page isn’t better than the “Recent Activity” of the old profile. Although it’s more visual, it doesn’t flow for me. I liked having a profile where I could read posts straight down and scroll. Now, my eyes are doing this zig-zag thing with Timeline’s two columns, and it’s annoying. In my opinion, Facebook needs to stop changing things that already work, and if they decide to change something, at least make sure it’s 100% better… and Timeline has it’s flaws. Instead of force all users to use Timeline as the “new profile page,” make it a new option. So everyone keeps their profile pages, and if the user or his or her friends wants to use Timeline, a button could link you to that page. Take the good stuff and apply it to the profile, and keep it as a profile page… simply saying, improve it, and not reinvent it! So what do you think about Timeline? Of course, most people complain whenever Facebook makes a change, but usually they get over it. One person may post that he will leave Facebook for good… but he won’t. So, leave me a comment voicing your opinion on Timeline! Do you agree with what I think of it? Do you like it more? Maybe you hate it? Comment please! I agree, Facebook needs to stop changing things that aren’t broken. Hi Mikey! 🙂 you have a top blog indeed, have most enjoyed my time on your page. 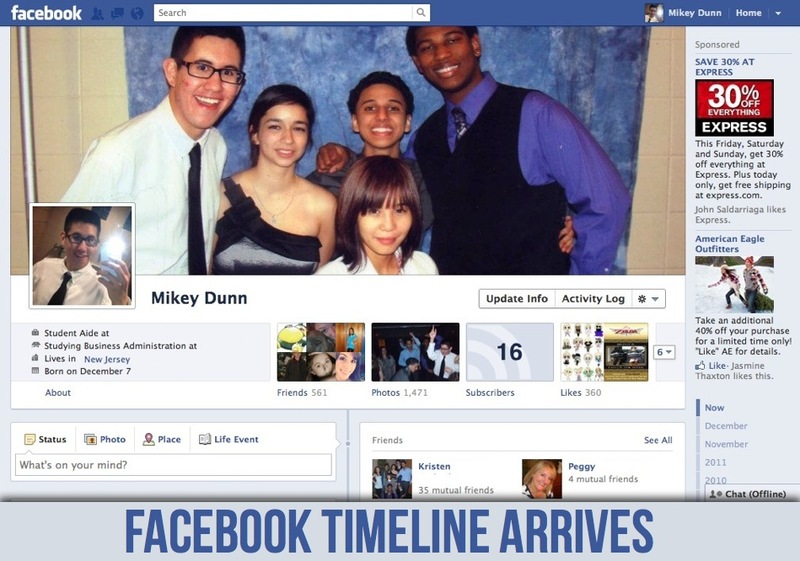 Personally i am liking the new timeline on facebook more than any other change they have made. Maybe its because i am more visual and it certainly is nicer to look at imho. I also like the fact you can add extra key moments into the timeline so you can have complete picture of your life…whhheee fun! 😉 you will get that when you are nearly 40 and feel 18!! On the downside the Pages do not have this new look as of yet so my fan page looks ‘strange’ 😀 Im sure i shall cope till facebook catches up with itself. haha.